If you are opening a business, one of the most timeless and important ways to market your brand is through your signage. Although you see signs everywhere, you may not have put much thought into them until now. However, the right sign can have a huge impact on your business. Whether you are a national corporation or a small business, you need a sign that creates both visual and emotional impact. Not only should your sign catch the eye of potential clients, but it should also help convince them to enter your place of business. 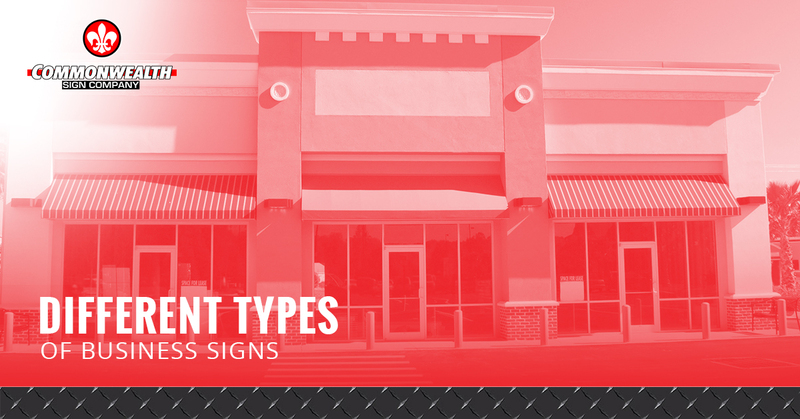 Today, we would like to discuss the different types of signs that are available. Not only are painted plywood signs affordable, but they offer many creative options. Plywood signs can be painted using a variety of colors and techniques to create a truly customized sign. The cost of these signs depends upon factor such as size, types of paint, font size, and the type of wood used. The downside of these beautiful signs is that they can be damaged by weather, so they will need to replaced more frequently than other signs. Constructed out of vinyl, plastic, or nylon, fabric signs can be both colorful and affordable. For optimal results, we recommend paying a little extra for fade-resistant and heavy-duty fabrics so that you can get as much mileage as possible out of your sign. Please keep in mind that some upkeep is involved in these signs, and you’ll have to replace them eventually. Painted glass signs are a truly classic, elegant form of signage that can be administered at affordable prices. Generally, the more basic the sign, the lower the cost. However, more elaborate detailing as well as high-quality, all-weather paints will be more expensive. The downside to these signs are that they aren’t always visible when the sun is brightly shining and they’re not always easily seen from the street. Not only do awning signs provide gorgeous signage for your business, they also offer shade and shelter from outdoor elements for potential clients. Pricing depends on the hardware needed for installation as well as the material and size of fabric used. An even more enticing benefit of an awning sign is that it could save up to 50 percent on your cooling costs in the summer. Awning signs typically last for long periods of time, making them an excellent choice for business owners. If you are looking for a long-lasting, weather-resistant sign, a punched metal signboard might be the perfect choice for you. Pricing is dependent upon colors used, texture, and size. You can customize these signs for a cleaner, more modern design or go for a more classic look as well. A truly durable and weather-resistant choice, these visually appealing signs hold up well throughout the years. The pricing on these signs depends upon the amount of detailing involved in their creation. Therefore, the more customized a sign, the more it will cost you. That said, the price is worth it due to its longevity. These metal signs refer to the 3D signs that you see on storefronts. Pricing varies on these signs depending upon the type of metal and the size of the lettering, and they can be lighted for an additional fee. We recommend adding lighting to your sign so that it’s visible during all times of day and in all types of weather. No sign catches your eye quite like a neon sign. However, these signs are pricey, and they will contribute to your energy costs as well. The upkeep of neon signs is also rather costly, but this signage stands out like no other. Because these signs are constructed out of glass tubing, they are vulnerable to breakage, which is expensive to repair. Not only are rock signs sturdy and weather-resistant, but they also provide an elegant, professional appearance. Stone signs range in pricing,but you can also request alternative stone for a similar look and lower cost. The downside to stone signs are that their heaviness makes them extremely difficult to move if your business ever relocates. Contact Commonwealth Signs to learn more about the types of business signs that are best for your company. With decades of experience, we are proud to provide high-quality custom signs at affordable prices in a timely manner. Our sign company would love to add you to our list of happy clients.